HDLC Impairment Utility impairs HDLC frames on T1 E1 lines, whether they occur on single timeslots at 64/56 kbps rate or as hyper channels wherein contiguous timeslots are used to create N x (64/56 kbps) channels, with N possibly equal to the max timeslots of 31/30/24. The application can use any of GL's T1 E1 platforms including T1 E1 Universal Cards, Dual PCIe Cards, tProbes™, USB T1 E1 Analyzers, and Octal T1 E1 Cards. This software is provided as part of our HDLC suite which includes HDLC Protocol Analyzer, HDLC Playback, and HDLC Simulation. The application is useful in simulating real network conditions and the impact thereof on protocols such as ISDN, SS7, and other HDLC based protocols. It is also useful in verifying proper operation of HDLC hardware/software implementations. Impairments that can be introduced are: Logic Errors, CRC Errors, Drop a Frames, Change Order of Frames, Duplicate a Frames, Insert a Frame, and Delay a Frames. These impairments can be introduced manually or automatically with a specified random rate, e.g. 1x10E-04, or one in 10,000. The application also provides options to impair frames either manually, or using automatic random error insertion mode. The main objective of this application is to verify the proper working of HDLC protocols by simulating various scenarios taking place in a real-time network. Impair (inject errors) specific HDLC frames of a real time HDLC frame stream in manual or automatic random mode. The GUI screen below shows the main features of the application. Note that automatic error rate can be from 1x10E-6 to 1.0. The input and output ports can be the same or different (Card1 (Port1) or Card2 (Port2)). HLIU can be used in conjunction with GL's HDLC Playback File, HDLC Tx Test, HDLC Rx Test, and HDLC Protocol Analysis applications. Insert Frame to insert additional frames. Error Counters: It displays the total number of CRC, Logic, Drop Frame, Change, and Duplicate errors impaired to an HDLC frame. Logic Error: The first byte of the HDLC frame is complemented, i.e. for example, the screenshot below depicts the first byte of the frame # 1 changed from"00" to "FF"
CRC Error: Single shot CRC Error into an HDLC frame alters (either increments or decrements) the last two bytes (CRC). The screenshot below shows the CRC error inserted on frame # 15 and the CRC value is decremented from "E899" to "E898". Drop Frame: Drops a HDLC frame from the incoming stream and sends continuous flags in the place of dropped HDLC frame. The screenshot below depicts the frame # 1 order number changed from '01' to '02' due to a dropped frame. Duplicate: Duplicates a frame and transmits the duplicate frame right after the original frame. The screenshot below depicts the frame # 0 duplicated as frame # 1. Insert a Frame: Inserts a predefined frame at the output. The screen shot below depicts that at the end of 100 frames of transmission, a predefined frame is being inserted and the total frame count is incremented by '1'. Delay Frame: The input frame is delayed before output by a specified amount of time in milliseconds. The screenshot below depicts the delay of 5000 ms inserted between frame # 39 and frame # 40. For example, transmit a sample hdlc file from HDLC Playback application. Invoke HDLC Link Impairment Utility application on the receiving side, and manually click on each error type to insert errors such as CRC errors, Drop Frame, Duplicate Frame or other error types. 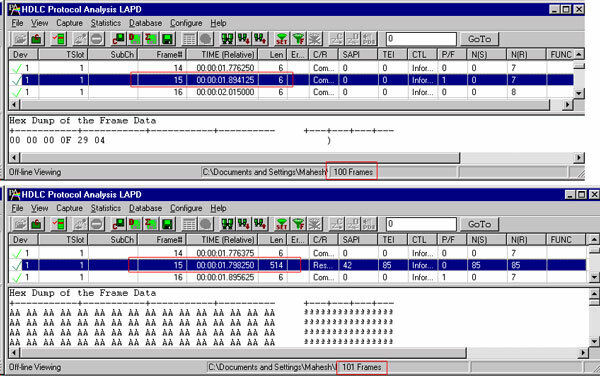 Verify the impaired frames using HDLC Protocol Analyzer as shown in the screen shot below. For example, transmit a sample HDLC file from HDLC Playback application. Invoke HDLC Link Impairment Utility application on the receiving side, and choose Automatic Random mode to auto insert errors such as CRC, Logic Errors, Drop Frame, Change, and Duplicate at a specified random rate. Verify the impaired frames using HDLC Protocol Analyzer as shown in the screen shot below. For example, transmit a sample HDLC file from HDLC Playback application. Invoke HDLC Link Impairment Utility application on the receiving side, and choose to insert delay as 5000 msec. 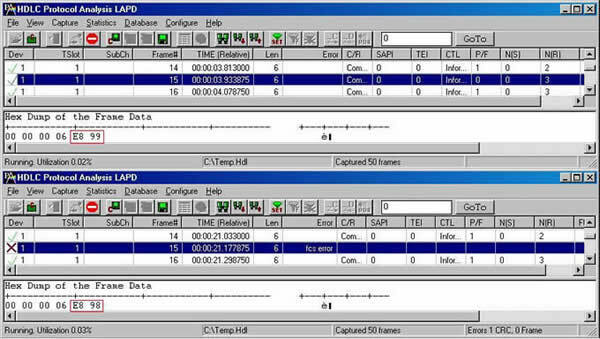 Verify the delay in captured frames in the timestamp field using HDLC Analyzer as shown in the screen shot below.